December 2015, the Coromandel Coast region of South India saw an unprecedented flooding as a result of heavy rainfall. Citizens banded together to rescue others stranded in their homes as the water levels rose to alarming levels. The storm brought life to a standstill and almost everyone experienced some kind of loss. Sanmar rose up to the need of hour like always and distributed 50 Tonnes of rice bags to the flood affected families at Cuddalore and Karaikal. Many Sanmarites from day one of the calamity provided support to people in their neighborhoods, in different ways - physical help, food and providing a place to stay. Many worked with volunteer groups. Closer home, at Sanmar, we did a quick appraisal of the extent to which our colleagues in Chennai (and Cuddalore) had been affected by the floods. Some 38 families suffered moderate to severe damage by the onslaught, while ten of them were very severely hit. The Group’s immediate financial assistance to a large number of employees in Chennai and Cuddalore came as a big relief to many who needed immediate financial help. The Group has also provided assistance to some employees who suffered moderate to severe damage. Cyclone ‘THANE’ ravaged Tamil Nadu & Puducherry inundating cities, towns and villages. 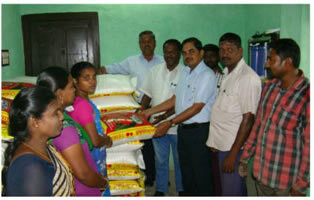 In the aftermath of the floods, Chemplast Sanmar distributed rice and food packets to the villages around Karaikal. Families from villages in Vadakku Vanjore, Keezhavanjore and Mudalimedu located around Karaikal received the relief materials. Barrels handed over to the collectorate at Karaikal for use in the Solid Waste Department. Spurred by its success in Mettur, Chemplast Sanmar's remedial classes (after school coaching classes) provided to schoolchildren was extended to Karaikal. Another centre to provide coaching for school children with a full-fledged tutor was established at Vadakku Vanjore. 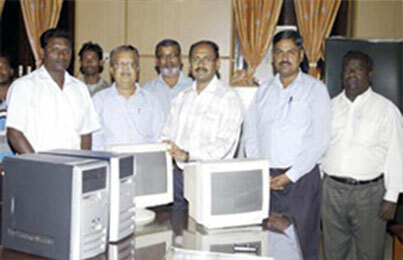 Chemplast Sanmar donated two computers complete with accessories to Vadakku Vanjore Panchayat. These computers will be used to provide computer literacy to young children at the tuition centre. A dedicated person has been appointed to provide training to at least 61 children in Karaikal. A free medical camp for general and eye check-up was organised by Chemplast Karaikal in coordination with Vinayaga Mission Medical College and Hospital at Mudali Medu and Vadakku Vanjore. 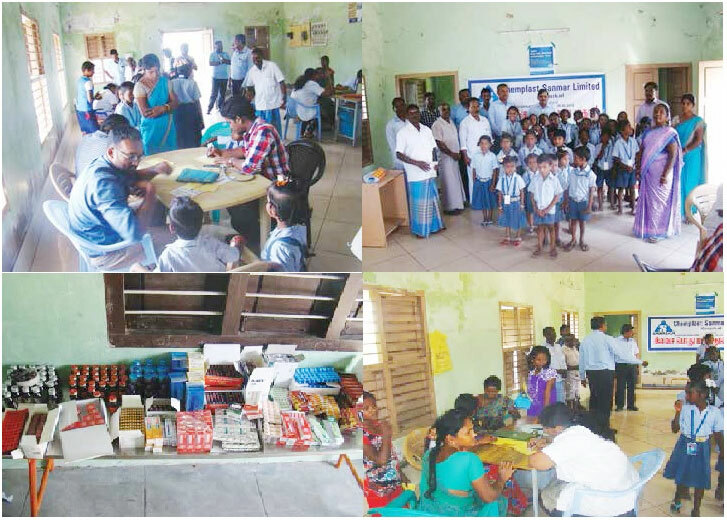 More than two hundred had benefitted from the camp which was organised at the local community halls, under the aegis of the district collector of Karaikal, P Parthiban, under the supervision of the Medical Superintendent, Government General Hospital, Karaikal, Dr P Chitra. A camp for general medical screening and eye check was conducted by Chemplast Karaikal in coordination with Vinayaga Mission Medical College and Hospital at Community halls at Mudali Medu and Vadakku Vanjore villages. The camps were arranged at the behest of the District collector of Karaikal T Karikalan under the supervision of Dr P Chitra, Medical Superintendent, Government General Hospital, Karaikal and the active participation of the village Panchayats. Over 160 villagers benefited from the camps. A free health camp for general and eye check was conducted by Chemplast Karaikal jointly with Vinayaka Medical Mission College and Hospital on 22 June 2013. The camps were conducted at the community centres of Mudali Medu and Vadakku Vanjore villages of Karaikal to facilitate easy access to the rural populace. Conducted under the guidance of J Ashok Kumar IAS, District Collector, the camps were supervised by M Kandaswamy, Medical Superintendent, Government General Hospital, Karaikal and Chemplast's Dr Sathiyanarayanan. At the request of Dr A Muthamma, Collector, Karaikal, split air conditioner units were donated to the maternity post operative ward at the Government General Hospital, Karaikal, by Chemplast Sanmar. Medical Superintendent Dr M Kandasamy received the units.